On Sunday, April 22nd, members of our club volunteered to man a rest stop for the MS Bike Ride. 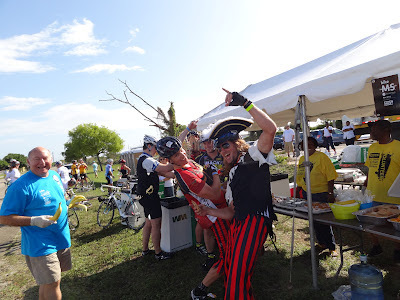 Our job was to organize and serve food and beverages to the bikers as well as to cheer them on toward the finish line. 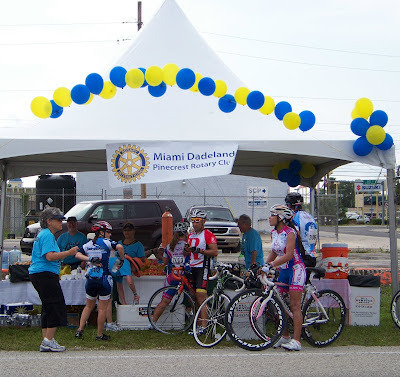 Biker and fellow Rotarian, Debbie Swain, President of the Coral Gables Rotary Club along with her husband and sister stopped at our rest stop. The pirates was one of the most entertaining biking team that stopped—the peanut butter jelly sandwiches that we served prompted them to sing for us—they did a great job singing the popular song “It’s Peanut Butter Jelly Time”!! We all had fun and enjoyed helping support the Multiple Sclerosis Society.